Interested in taking a course in Natural Building? Visit OUR Events page to see our current offerings. Natural Building is building structures using materials such as cob, straw bale, natural plasters and timber frame; materials that occur naturally with as little processing as possible. It is the integration of natural resources into the structure environment using solar hot water, rainwater catchment and wastewater management among emerging forms of sustainable building practices. Consequently, natural building structures live and breathe in the environment, naturally controlling temperature, humidity and toxins in the environment. It is one of the main learning streams at O.U.R.Ecovillage. How has Natural Building been used at O.U.R. Ecovillage? We started in 2001 with small projects: an oven and bench, a children’s playhouse in the garden. Then, in 2003, we took on a large building – the Elke Cole – and hosted our first summer program “Plan B- Practical Leadership and Natural Building”. Our site was slowly being developed- suddenly we needed outdoor facilities: showers, toilets etc. for a group to be able to live here for the summer. An enthusiastic team supported the program with food, fun, and hugs. The building students worked hard- a massive stone foundation took a few weeks to complete. We had the support of an engineer who came in occasionally to check up on things. And yes, we had a building permit. Dana Gaab from Oregon took on the lead for the log structure of the Sanctuary. Moving large logs with intelligence, manpower and winches is one of the strong memories of working with him. 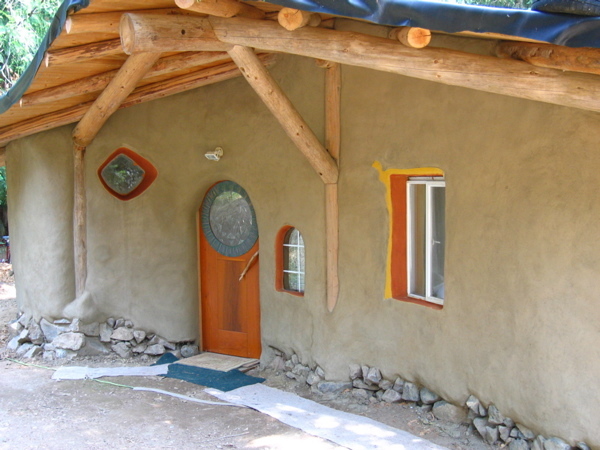 Cob was next – the southern half of the exterior walls in the building are cob, the northern half Strawbale. For the interior we used a combination of cob and light clay as wall materials. Everything is finished with Earthplasters, largely made from local clay. Our first season had the walls up and log structure finished and a temporary roof to keep the elements out for the winter. I have to mention here that most of the materials used were generously donated by businesses from our community. Our climate is such that we can work with cob only from May- September- outside of that the material doesn’t dry and will show frost damage. Interior work can of course carry on into the colder seasons provided there’s some heat and good ventilation. So our third season on the Sanctuary building took us through the summer and into the fall with finishing work and finally the grand opening in December- with the first snow falling that morning. A Natural Building like the Sanctuary is a powerful experience for those who have never had the chance to visit one. Planned and built with intention, it has the visitor become quiet to feel the space. Soft shapes, plenty of daylight, relief sculpture, and a heated floor invite the visitor to linger and relax for a while. 2005 was the year of the first Natural Building Skillbuilder: a fresh vision for the program and a new building to start: the Chillage. Intended to be a covered outdoor space for the learning community to use, it was designed by the students and built during the program. The Chillage gave an opportunity to build rich with sculptural detail and participants took on individual areas to completion. As the Ecovillage continues to expand its capacity for hosting events and more and more visitors come every year to look at ways for sustainable living, we keep taking on the next challenge. We started with the re-zoning of the land and continued with permitted natural buildings . FOG -finance ,ownership and governance- is the next frontier of research to complete in order for housing to fully start. On the land the gardens have expanded threefold; chickens, ducks and turkeys are integrated into the mix and a new orchard is being developed. Our woodworking shop turns out beautiful doors and windows and the barn is full of recycled and donated materials. The Natural Building program is now finishing the Art Studio to the North of the garden: another hybrid natural building with a small living space, attached studio space and a classroom/ library/ gallery upstairs. This building features cob and light clay (chip’n slip), log frame, and an assortment of recycled materials from flooring to old metal roofing for a rainscreen over the light clay walls. This building was chosen for Olympic Legacy funding in 2008 and was completed in 2009. As one building gets finished another starts up and the first house is now under construction. 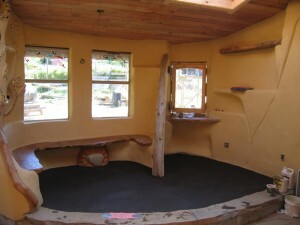 This hybrid Natural Building was also designed by Elke Cole, and features an earthbag foundation with cob and bale walls and a timber frame structure. There are also two additional houses under construction in our housing cluster. One of them, the Turtle House, was started by our 2013 Cob and Community interns, who did a huge amount of work in just one season, making the urbanite foundation, cob walls, and timber frame. A spiral staircase leading to a cozy loft area is one of the showpieces in this building. Late 2013 also saw the soft opening of OUR Zero-mile Meal Eatery, a cob project built on to our Commons building. The eatery, which will seat over 100, features a small stage area and will be linked to our teaching kitchen. This space will not only allow us to host larger local food feasts at all times of the year, but also allows students to learn more about food preparation and preservation as they take courses and workshops with local chefs. 2014 sees this building continue to move forward to final completion with finishing touches such as the living roof soon to be underway. Who can be a Natural Builder? Natural Building invites full participation of all parties involved- it has the ability to integrate everyone’s creative input and expression, and from that comes the beauty of the truly “handmade house”. We will continue to build, teach and learn and build ever better examples of sustainable housing.